There is nothing better than enjoying great food and a cool glass of fizz next to the beach. 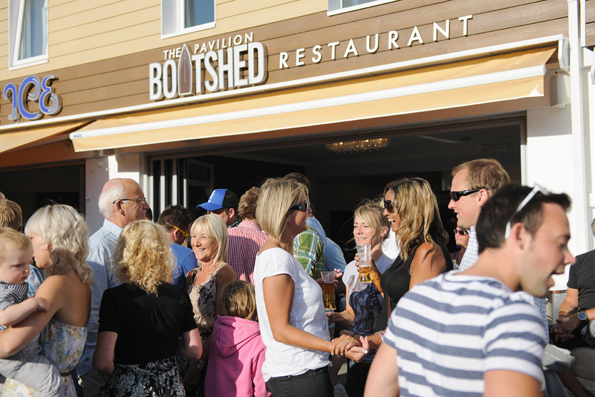 Welcome to The Pavilion Boatshed Restaurant, Perranporth’s premier dining experience, which with Pavilion Ice, the luxury handmade ice cream parlour next door, create the Perranporth Pavillions. This stunning yet relaxed open plan restaurant is the perfect place to enjoy breakfast, lunch, dinner or a cold glass of Prosecco while watching the world go by. Using the finest local produce and inspiration from the Cornish Coastline, Matt has created a stunning and varied menu, offering the very best in Cornish cuisine. Matt Burrell, owner and head chef, has worked around the world to develop his passion for good food and intriguing new flavours. After travelling and honing his culinary skills, Matt returned home to start a new venture in his hometown of Perranporth. Using his love of fine dining he has turned the Pavilion Boatshed Restaurant into one of the most popular and versatile places to eat in Perranporth.